MATTA FAIR 2016 happened from the 11th of March - 13th of March 2016. MATTA FAIR-Malaysia's premier travel fair providing global exposure and business opportunities. It took place at PWTC, KL, comprising of Hall 4, 3, 2, 1, 1M and Linkway of PWTC, KL. MATTA FAIR provides visitors with a host of interesting and value for money travel options. This travel fair is so famous that it attracts more than 100,000 visitors from Malaysia. It was my first time going to MATTA FAIR. This event was so huge that Jane and I got lost twice. our Tokyo experiences at the Tokyo Tourism booth. Let's talk about Tokyo, Japan today. I love working with Tokyo tourism because firstly, the clients are very nice and polite. Secondly, they give a lot of freedom on my writing. They just want me to share my genuine thoughts about Tokyo. I fell in love with Tokyo because of my best friend, Jane. She introduced the greatness of Japan to me. She made me promise her to go to Tokyo with her when we were only 14. After I finished my studies in Australia, I saved some money. So, we were off to Tokyo, our very first trip together. It was supposed to be a #daphchuck trip but it was even better because Ashley and Natalie joined too. 4 girls, we took over Tokyo, lol. We reached Tokyo at midnight and we hopped on the train. We were walking on quiet streets in the midnight, dragging our luggage all the way. The Tokyo streets are so safe that we weren't even afraid or worried. It was exciting to us, taking public transport, walking, discovering new places. It was like an adventure. Look at my horrible eyebrows, hahaha! What impressed me most was Tokyo's fashion. There are so many brands that are not "accessible" in Malaysia. There is Joyrich, there is Candy Fake Tokyo which gathers different brands, like a hub. Local designer brands are enticing too. Unique, latest trend, edgy, whatever you're looking for. The last time I went, I shopped at Fig and Viper, UNIF and COMME des GARCONS. I don't know how a crazy shopper will I be if I return to Tokyo in anytime soon. Have to go after some Yohji Yamamoto. Do get your copy of Nylon Japan magazine before travelling to Tokyo. You can learn about different Japanese brands in the magazine. I also had to talk about how I didn't use to eat ramen and sashimi before my Japan trip. It's Jane again, she always wants to have ramen and I always have to go with her. Ever since that time in Tokyo, we went to have ramen in a back alley. I don't know where but ramen tastes amazing everywhere in Tokyo. I fell in love with ramen ever since. Talk about sashimi, I never get enough of chutoro nowadays. Already craving for it as I'm typing this. Back to the travel fair. Check this Tokyo tower soft toy, so cute. but it was raining, 3 days straight, so we missed it. Will definitely pay a visit to Tokyo Tower the next time we go back. Phat Fabes, entertaining the crowd. Mostly families and couples looking around for good deals. It was like a family day. Me, playing with seketul Han, Cik Epal's son, haha! She and her family just went travelling to Tokyo last month. We took turns to share about our experiences at Tokyo. Also had a small photo session together. We went to different booth to check different Tokyo packages. Jane is bugging me to go to Tokyo again soon. FYI, she just came back from Tokyo last month. 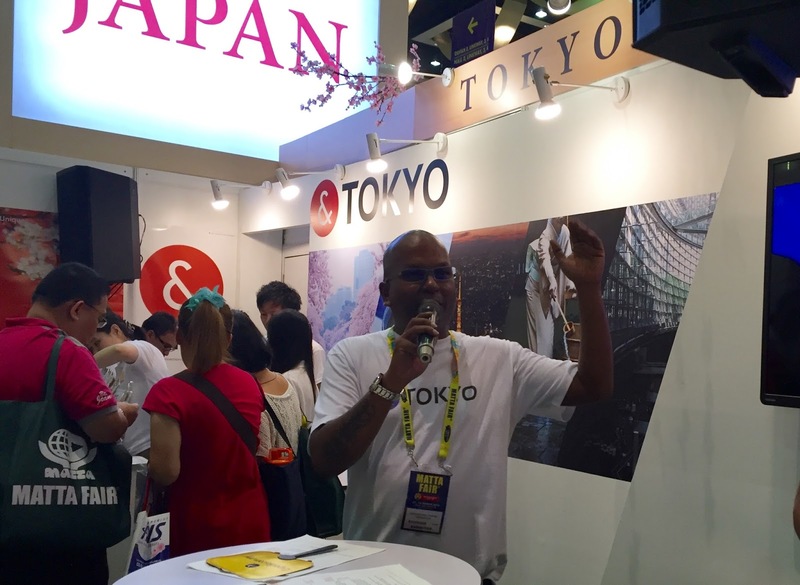 Thanks to Tokyo Tourism and MATTA FAIR for having us! I would love to go to Tokyo too! I just came back from Hokkaido, first time in Japan, never had the urge to go before this but ever since I've gone I can't wait to go back. I have to say it's one of the best places I've ever been to and I've been to / lived in quite a few places.